I love hi-fi shows. Going from room to room, hearing different demos, admiring the tech. Sure, the situation isn’t ideal. There’s lots of noise, lots of people. Not much tranquility. And the demo rooms aren’t exactly ideal, acoustically. But I enjoy the diversity. 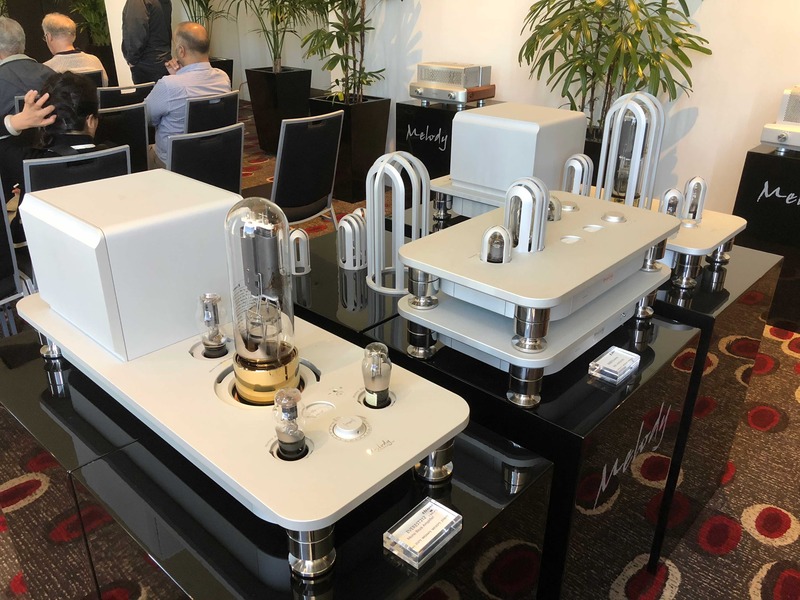 So I went along to the second iteration of the Melbourne International Hi-Fi show with modest expectations. My only hope was there’d be at least one instance of hearing something special. And there was. We’ll get to that in a minute. But first I just have to get something off my chest. Which is the mediocrity of the demo tracks played. Not only in terms of content (Fleetwood Mac, Pink Floyd, et al) but in terms of sound. Until very recently I thought pleasing hi-fi was beyond the reach of my crusty old git ears. But then I bought Oppo PM-3 headphones, and teamed ‘em up with the Oppo HA-2 external DAC. Then downloaded some hi-res samples from HDTracks.com, playing them on the HD-friendly Onkyo player app on my iPhone. Put all that together and … wow! Take the demo track by Cassandra Wilson, ‘Another Country’. I could hear decent bass: clear, rich, spatial, gutsy. And the higher frequencies were crystal clear in a way that made me realise my ears weren’t really to blame. 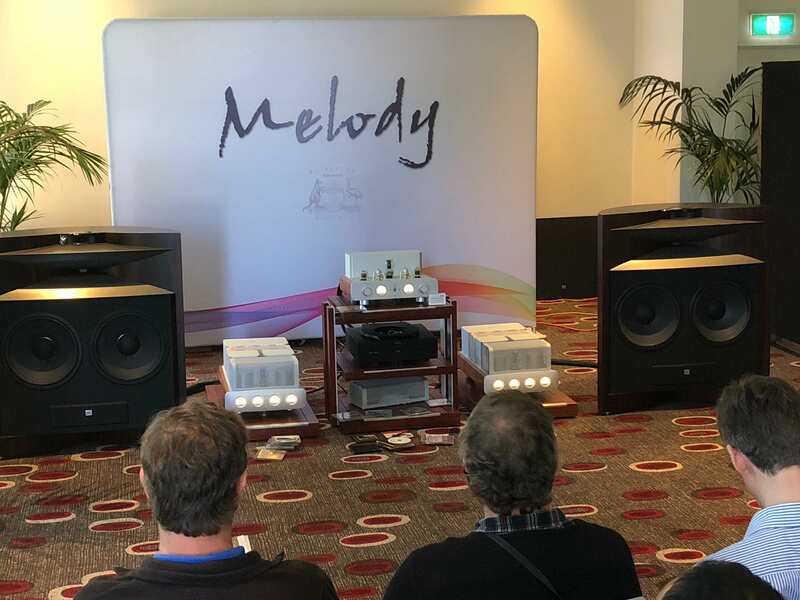 At the Melbourne Hi-fi Show, about 60 per cent of the demos I heard sounded rather lifeless. One vendor (who shall remain nameless) played a Beethoven piece through some imposing speakers. It sounded dreadful. Was it the setup, or perhaps it was a vintage recording? The sales guy said what was playing was “44.1Khz, 16-bit… CD quality.” As if that was, like, optimum in this situation. But these days, particularly for a demo of expensive gear, ‘meh’ is just not good enough. If you want to show off your wares and impress the punters, why on earth would you stick with ‘CD quality’, when there are sonically far better options, not only in terms of resolution, but actual recording quality. Going from room to room I heard some nice kit (massive Osborne speakers blasting Pink Floyd, Redgum’s reasonably priced selection). Although the sound was often tight and spatially nice, overall, many just didn’t have any noticeably deep bass or that ‘something special.’ Was everyone playing ‘CD-quality’ files, or had they just picked MOR content above demos that could have shown the products at their very best? It was all rather disappointing. Until I came across a pair of these hotties in action. They’re Kii Three speakers, from Germany’s Kii Audio. $16,500 a pair (all prices in $AUD). Six 250w power amps in each. 1500 watts per speaker! 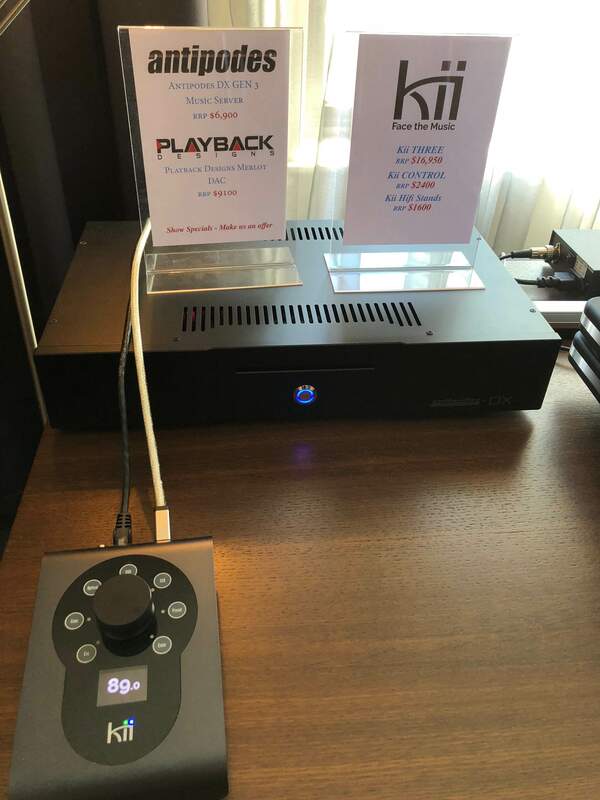 The vendor used an Antipodes DX GEN 3 Music Server (from NZ, $6900) to demo the Kiis. The first track I heard was an a capella African tune, possibly from Paul Simon’s Gracelands. Vocals were beautifully rendered, crisp with detailed textures. As I was getting up to leave, they switched to a track by Yello. I quickly sat down. I just had to. The overall clarity, the bass – phenomenal. Not over-the-top, but simply ‘there’, with plenty of space and presence. This was easily the best thing I heard at the show. It was in another league. Were they playing ‘CD quality’ audio? It didn’t matter. What mattered is they were giving a demo that absolutely showed off the best this gear had to offer. Kii Threes are getting good press, and if you want to know the finer details of their underlying tech, check this out – http://kii.audio/en/press.html. An optional extra for the Kii Threes is the Kii Controller ($2400, see below). This is a ‘remote control’ of sorts, for adjusting speaker dynamics, phasing and so forth. Kii Threes are used as studio monitors. 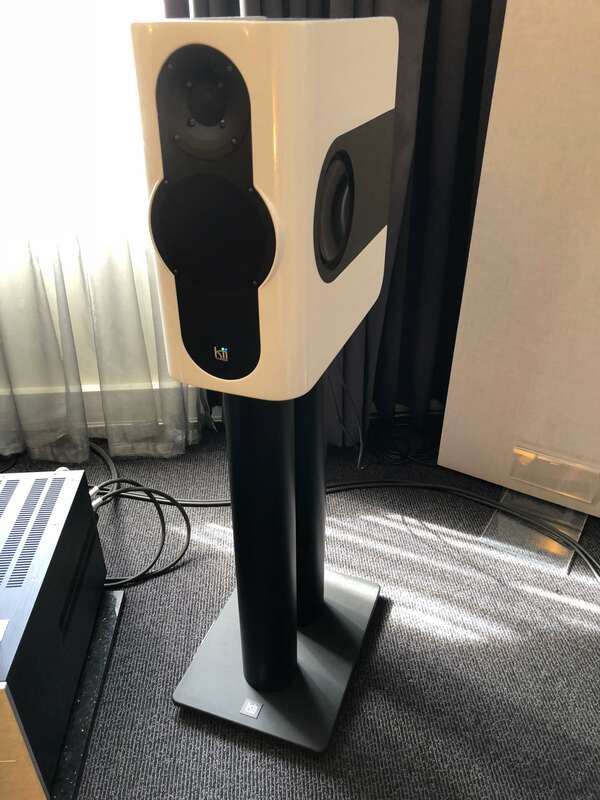 Home users can purchase the Kii speaker stands (another $1600). 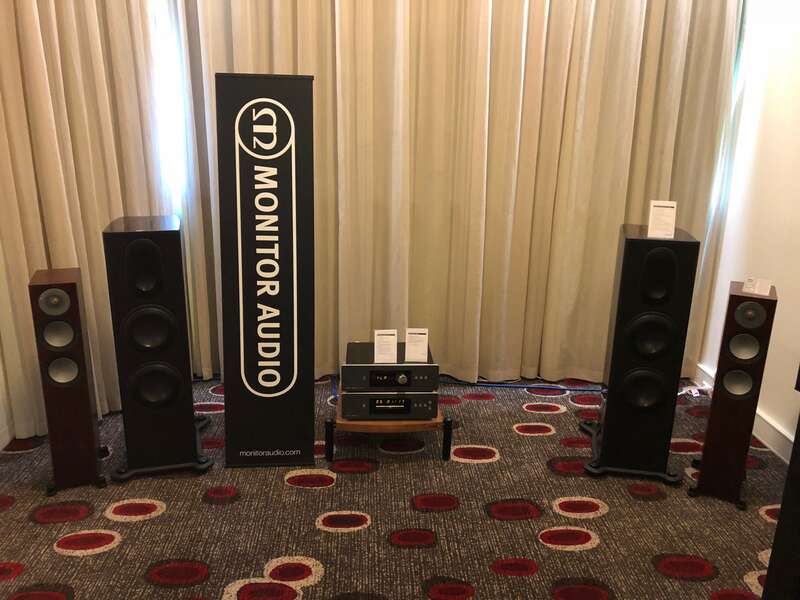 My second favourite listening experience at the show was, surprisingly, Monitor Audio. Their demo of baroque violin displayed an unbelievably crisp presence and quiet authority. The sound just stood out, whereas many other demos I attended sounded flat and lifeless, no matter where I sat. The speakers I heard were Monitor Audio’s Platinum PL300II ($18,975). Audio came via a Roksan Blak amplifier ($6100) and Roksan Blak CD player ($5300). The most ‘interesting’ exhibitor at the show was Melody. Their valve amps are physically huge. And expensive. 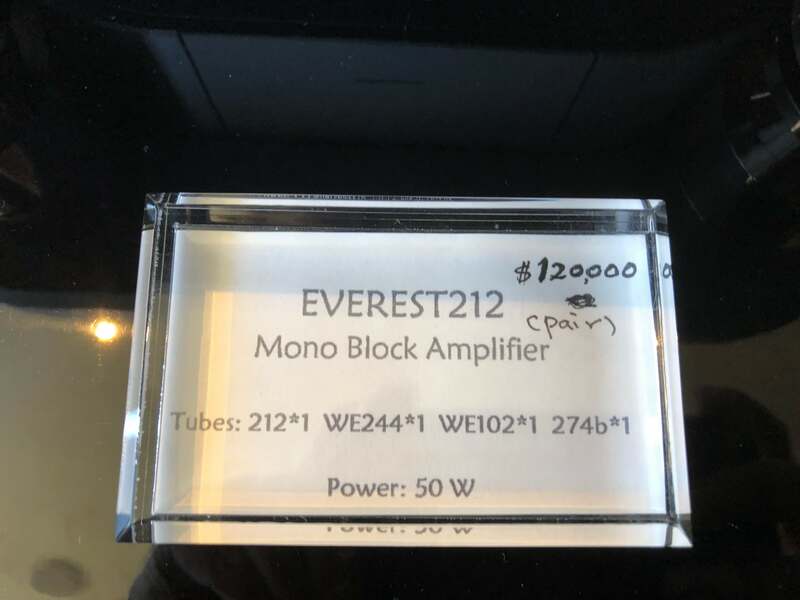 Like $120,000 for a pair of Everest 212 mono block 50w amps (one shown below left). 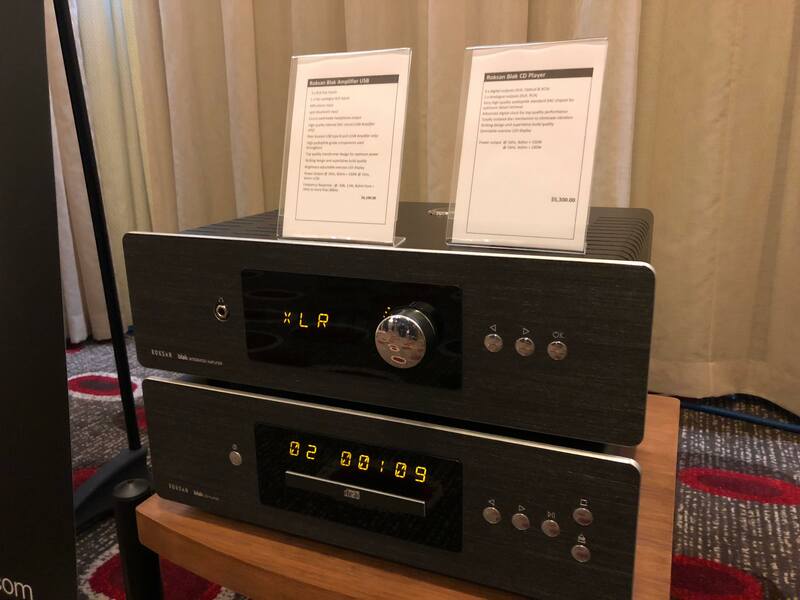 And $36,800 for 8688 Everest pre-amp (right). Melody had an imposing setup at one end of the room, which blasted out a Beethoven symphony during my first visit. But to be honest, it didn’t knock my socks off. It was loud, it was okay. Perhaps they were using vintage recordings as well? Maybe it would have much more wow-factor with better recordings? 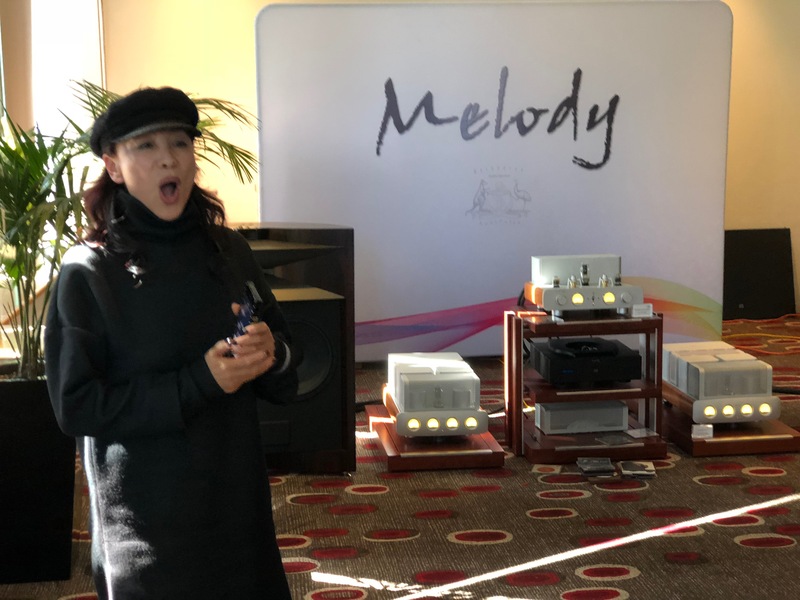 Melody’s other notable event was using an opera singer who performed live alongside (presumably) a recording of her own work. (See photo at the beginning of this piece). Well, that’s what seemed to be going on. There were other rooms with gear that sounded nice (e.g. McIntosh), but there was so much to see and hear that it was impossible to check it all out. The show was well-organised and held in a great venue, the Pullman Mercure in the central suburb of Albert Park. There was also a room full of vinyl for sale. Most of the product demos were either vinyl or file – not many CDs or SA-CDs used, from what I could tell. The Kii speakers knocked my socks off. Monitor Audio got the silver medal. Sub-standard audio presentation, for whatever reason, was the biggest surprise and disappointment. But it was an enjoyable event nevertheless.